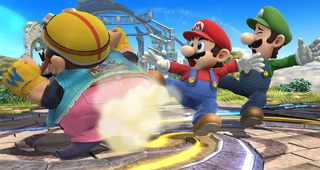 Wario in Smash 4 using his farting move. His voice getting louder, Husisian continued: “This was hosted at a hotel. How on Earth do they provide showers for people—free soap, free toothpaste—and people don’t shower! Have you gone outside? Have you met somebody?”. The next day, Husisian said, the same people still reeked. Smash event attendees have been trashing each other about tournament stench for years. In 2008, a California tournament organizer put a rule into effect that, if players aren’t keep up with their hygiene, he has the right to disqualify them. In 2015, a Tallahassee Smash event coordinator feared losing their biweekly tournament slot after locals apparently labeled it “stinky day.” Smash games can get intense, tickling players’ sweat glands, and that odor can become particularly pronounced around games for which opponents sit next to each other. Unfortunately, compounding upon that, it looks like some Smash event attendees don’t take precautionary measures. Since the mid-2000s, Smash.gg’s tournament organizer Bassem “Bear” Dahdouh hasn’t seen a month go by without somebody complaining about body odor at a local, regional or major Smash tournament. It’s not that a majority of Smash event attendees smell, he told me over e-mail. (He estimates that it’s only five percent of attendees at any given competition.) In fact, almost everyone I talked to said the stereotype is overblown. It’s that the players who stink tend to really stink, and worse, not enough attendees have the guts to let them know. “I’ve told people face to face their BO is getting to me when I make the rounds around [tournament] Pools,” Dahdouh explained. “If someone’s smell is so distracting to the point where others are complaining, I’ll gladly speak to that person to help remedy it.” At last year’s EVO tournament, Dahdouh reminded attendees to pack deodorant and shower daily with soap and shampoo. But showering and using deodorant doesn’t always cut it; the body and its clothes both need to be clean to ward off the stench. Yesterday, Smash player and event organizer Richard “Keitaro” King gave Smash tournament attendees some free advice: “You can shower, but if your clothes smell like garbage, you smell like garbage. Wash your clothes before you wear them 5 times in a row.” For players wearing jerseys—especially ones provided by sponsors of teams—fresh clothing options may be limited. Still, King punctuated his tweet with emojis of praying hands, ocean waves and a red “SOS.” Smash ‘N’ Splash tournament helper Thomas “Pooch” Puccio said that, since his upcoming Smash event takes place at a water park with plenty of showers, he’s hoping attendees won’t re-experience the “brutal instances of olfactory offenses” he’s lived through. The stereotype could come from Smash’s grassroots background as a game played in basements and low-cost venues with poor ventilation, said Smash event organizer Pidge. Her old local venue was a repurposed karate studio, which had no air conditioning, small windows and poor ventilation on top of already smelling like sweat. Now that the Smash community has expanded, she said, organizers have been able to find venues better suited to hundreds of people playing a stressful, sweaty matches. She’s also seen tournament organizers hand out deodorant. How Much Do Pro Gamers Sweat?